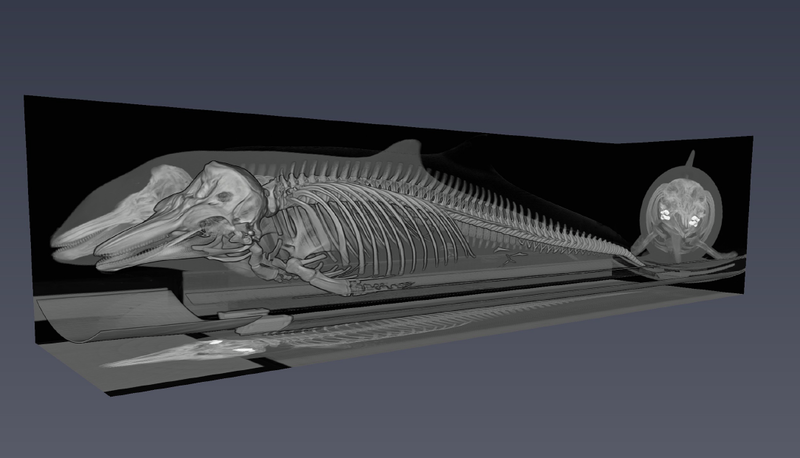 The Faculté de Médecine Vétérinaire (Liège) actually made a CT Scan of a harbour porpoise. The Task is to understand the internal anatomy of this very elusive species from the North Sea and to create of a 3D model for education. Since five years, the University of Liège promotes 3D animal models to explain precisely the anatomy ofdifferent organisms to pupils and students in close collaboration with professors from universities and teachers from high schools. They noticed most of the students had many difficulties to imagine the detailed whole organisms andto understand the physiology on the basis of histological cross sections or dissections. Computer graphics is apowerful teaching tool because establishments of models allow highlighting important parts of the organisms. Itallows also the pupils and students to view concretely the target organs in 3D and, consequently, to understandtheir relationships with neighbouring structures.